Methyltestosterone is one of the oldest available oral steroids. It is produced by many various manufacturers and sold in a number of countries including the U.S.. It is quite androgenic, with minimal anabolic effects. For athletic purposes, methyltest is generally only used to stimulate aggression among power lifters and those looking to boost up their workouts. 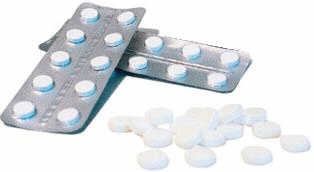 Many methyltest tabs are sublingual (to be placed under the tongue) for faster absorption. These tabs can generally be identified by a notable citrus flavor to them. A couple tabs placed under the tongue before a visit to the gym may make for an aggressive workout. Aside from this, methyltest offers little except androgenic side effects. It is quite toxic, elevating liver enzymes and causing acne, gynecomastia, aggression and water retention quite easily. Were one to tolerate these side-effects, methyltest will offer little more than some slight strength gains. One looking for quality muscle mass from a steroid cycle should be looking elsewhere. Counterfeit steroids sometimes contain only methyltest in an effort to deceive the buyer. This is due to the fact that it is very cheap in bulk and obviously may fool an inexperienced user.